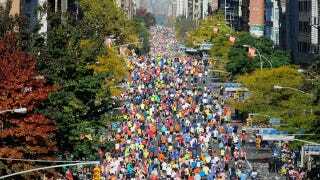 On Sunday the annual NYC marathon was held, but if you decided to skip the twenty six mile jaunt for fear of being humiliated, here are seven tools that will guarantee you at least finish next year's race. Or even post a remarkable time if you don't feel the rules apply to you. Training and working out is an important part of preparation for something as demanding as a marathon. But have you ever actually tried training and working out? It's not easy. That's why I like the compromise these Gymygym chairs offer. Gatorade? Powerade? Plain old water? If you seriously plan to run for twenty six miles you know there's only one source of quick energy you can rely on: Coffee. But since being scalded by a piping hot beverage could hinder your chances of finishing, Water Joe is a far better alternative. The power of positive thinking might get you to the starting line come race day, but after the pistol fires it's all about physical performance. So training is a must, and a great way to catch up on a lifetime of sloth and muscular atrophy is the Focus hydrotherapy treadmill. It's a lot like running on a regular treadmill, except that you're fighting the weight and friction of the water, and extra resistance from jets blasting at your legs. So it amplifies your workouts, giving you a fighting chance of not collapsing as soon as you pass the starting line next November. Once the race gets underway and you find yourself falling farther and farther back in the pack, you'll probably be second guessing all the training you procrastinated on all year. But at this point you're in the race, and nothing is going to stop you from finishing, not even that lengthy list of rules you agreed to. So it's time to break out your performance aids. Running the race with springs strapped to your feet isn't the most subtle approach, but you might be able to hide these Skataz electric roller skates with a particularly baggy pair of track pants. A 350 watt motor can propel a rider to speeds of up to 13.5mph, but staying on the slower side should help you blend in with the pack, and keep the battery running for longer than thirty minutes. Because they're electric they should be relatively quiet and stealthy, and since they strap to your shoes you can easily get rid of them a few miles before the finish line, letting you claim your handsome certificate of completion. Sadly, they only exist as a prototype waiting for a funder to make them a reality. But I can't think of a better reason for these to go into production. Maybe you're too proud to resort to using spring loaded stilts or electric roller skates to finish the marathon. You want to cross that line with one foot in front of the other just like everybody else. But your muscles are screaming that it's not going to happen without a miracle. Thankfully, a company called Cyberdyne has developed just such a miracle. It's hours into the race, most of the real athletes have already finished, and you're struggling to stay on your feet. At this point all the rules go out the window and you've gotta do what you've gotta do to just cross that finish line. So hopefully the night before you had the foresight to stash one of these Martin Jetpacks down a secluded alley.